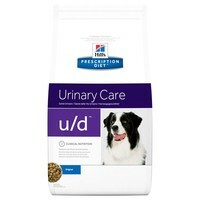 Hills Prescription Diet UD Urinary Care Dry Food for Adult Dogs is a nutritional diet formulated with a carefully balanced mineral composition to reduce the formation of bladder stones. Made using a balanced range of nutrients and high quality, easy-to-digest proteins, Hills U/D also contains very low levels of potassium, magnesium and calcium as a preventative measure against stones and crystals initially forming. The range of carefully selected vitamins in Hills U/D can also promote kidney functions and boost the immune system of dogs suffering from advanced kidney disease. This product helps keep my dog's health problems under control and he likes it, which is an added bonus.